William ‘Bill’ Wilson was the first president and operator of Great Western Arms. Prior to forming Great Western, he was an engineer at Northrup Grumman (Dougan). It’s unlikely his time with Great Western Arms extended much past 1956. Hy Hunter was a Los Angeles firearms impresario, selling surplus war arms through catalogs and an impressive shop in Burbank. In a 1955 Guns Magazine biography he was noted as WWII veteran and then 29 years old. When Great Western Arms stopped using Hunter as a distributor, he started importing single action clones from Germany. This eventually led to the formation of Hawes Firearms, which did business into the early 1980’s. Hy Hunter behind the counter of his shop, examining Great Western single actions with the legendary Carbine Williams. Dan Fortmann. Fortmann was an ex-NFL guard. After his playing career, he completed medical school and become a Los Angeles surgeon and the Rams team physician. He was inducted into the Pro Football Hall of Fame in 1965. He was a principal investor in Great Western Arms in 1954. Ferrocast. Ferrocast was a southern California foundry. They provided cylinder frames and other parts to Great Western before assuming ownership of the company. Dee Woolem – Dee Woolem was a middle-American musician. He worked as a skit actor at the Knott’s Berry Farm amusement park in the 1950’s. There he performed western plays and developed impressive gun handling skills. He went on to formalize the sport of fast draw. E&M had him on as a spokesman and endorser of the Great Western revolver in 1958. He is credited as the inventor of Great Western’s fast draw model. His notoriety led to other endorsement deals, including Crosman (air guns), and Tandy (holsters). 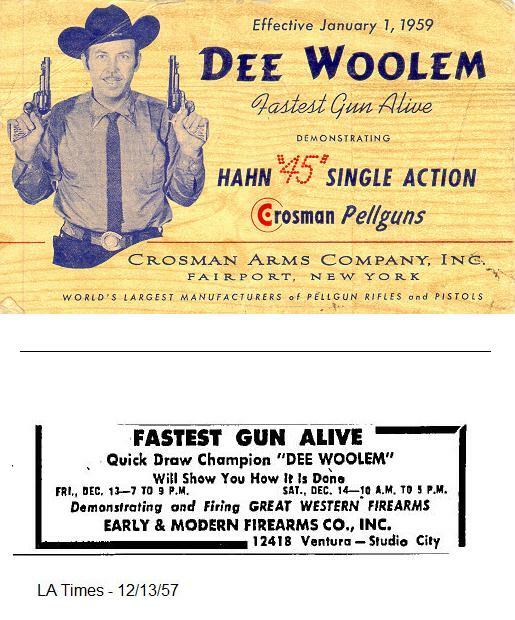 Dee Woolem, endorsing the Hahn BB single action for Crosman. Early & Modern Firearms. Ed Spinney operated EMF in the late 50’s as Early & Modern Firearms. Early & Modern Firearms was a successful mail order surplus retailer as well as a distributor for Great Western. In about 1959 Early & Modern Firearms purchased Great Western from Ferrocast. 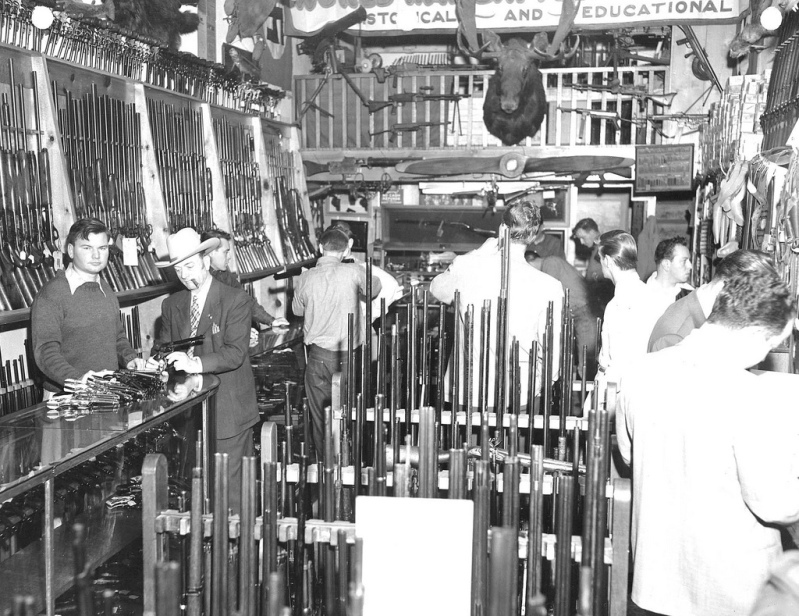 Boyd Davis was an early employee of Early & Modern Firearms and became its president over time. In the 1980’s and 90’s Davis was an inventor of cowboy action shooting in its organized format. Under Davis’ direction, Early & Modern Firearms revived its Great Western trademarks in 2003 to market an Italian made SAA clone called the Great Western II. John Wayne, Audie Murphy, and Mel Torme are often noted for some association to Great Western Arms. They are commonly referred to as investors and stockholders. There is no indication this might be the case. The confusion seems to step from an ad in which Wayne, Murphy, and Torme are listed as ‘owners’. This was meant that they owned Great Western revolvers, but this has been consistently misunderstood. Wayne was an early endorser. An photograph from 1954 shows William Wilson presenting Wayne with a pair of engraved Frontier revolvers. A photo taken at the same time but of Wayne alone with his Great Westerns was shown in the brochure provided with brand new Great Westerns. This photo was used into the 1960’s. Audie Murphy was the most highly decorated US soldier in World War II. In his post war civilian life he was a successful actor, rancher, and entrepreneur. Murphy endorsements appear in some early Great Western Arms ads, but he is more prominently featured in Hy Hunter catalogs. Murphy apparently patronized Hunter’s Burbank shop, and they were friends.